This will be yet another adventurous trip to see a total solar eclipse and to enjoy other sights and experiences that the place where it happens to be visible offers. This time the place is Sulawesi island in the far-away Indonesia. It was only a couple of weeks after we had come back from our previous trip to Svalbard in 2015 when people started to inquire about the next trip. There was no doubt, there would be a trip, but there were no plans whatsoever about it yet. Still people started to apply not knowing where this trip would take them and within two weeks there were 10 would-be ‘eclipsers’ when the trip was never meant for more than 8. Sulawesi? Google tells you, where! Managing more than 8 people is a big deal, but in the summer of 2015 it was decided to try going as a bigger group of 12 people (in 3 cars). The alternative was to split in 2 separate groups since everyone wanted to go. So the team this year is – Agnese, Anders, Andra, Dace, Gunita, Ilgonis, Imants, Ināra, Kārlis, Normunds, Rūdolfs and Vitolds. Exactly half of us have participated in at least 1 eclipse trip before and the other half will be the first-timers. The eclipse will happen on 9th of March and the totality (that’s when the Sun is fully covered by the Moon) will be observable in several Indonesian islands. March is the first month after the end of the rainy season in Indonesia, but it is not part of the dry season yet. To avoid the potential rain and the clouds we are going as far east in Sulawesi as we can get. The totality of the eclipse in our location will start at 8:42am local time and finish at 8:45am lasting full 3 minutes. To the right there is a map of the eclipse visibility. The light blue circle marks partial eclipse. The black dot in the centre marks total eclipse. The time in the animation is UTC. Interactive Google map with eclipse visibility times, length and coordinates. 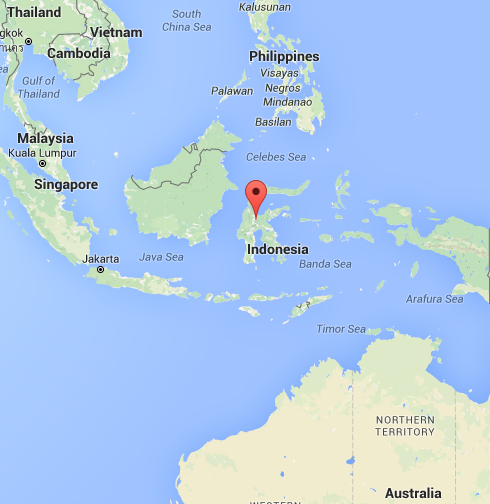 Then back on the mainland – that’s if Sulawesi island can be called so – and down to Makassar where we’ll get on a flight to Jakarta. We will spend a day here to see what the capital of Indonesia can offer and then head back home except for Anders who will do some additional exploring in this corner of the world. The others will be back on the evening of 19th of March.